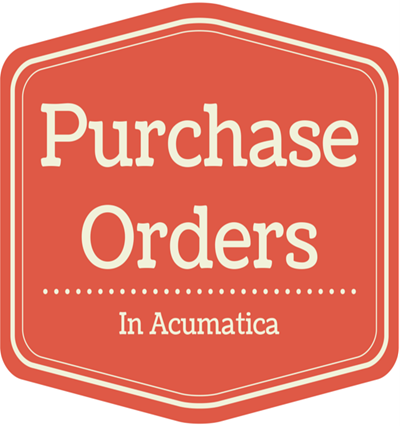 In this post I’d like to mention a few things about the Purchase Order module in Acumatica. Recently I passed the D120 Purchase Order Management course in Acumatica University. This post is not a comprehensive review of the Purchase Order Module by any means, but I did want to at least highlight a few things that stood out to me. The first thing that stood out to me in the Purchase Order module was the fact that there are only a few main processing screens. It makes the module look sparse and immature. However, I then compared the screens to the Purchase Order module in Sage 500 (which is the ERP product that I know best). The more I compared things, the more I realized that Sage 500 uses 5 or 6 screens to do what you can do in 1 screen in Acumatica. It’s just a different way of designing things. Acumatica seems to design their screens with the thought that you will want to perform many different actions from one screen which I think is a smart design approach since most people don’t want to be jumping around multiple screens all the time. Emailing Purchase Orders in Acumatica is very easy and very integrated into the screens. This is no surprise of course, given Acumatica’s strong document management and integrated email capabilities (click here and click here). I haven’t seen any studies or surveys, but I often wonder what percentage of companies still mail paper copies of Purchase Orders. My hunch is that it’s less than 50%. I’m pretty sure that most organizations email their Purchase Orders. Email is great, but there is still a lot of room for improvement. Think about all of those critical vendor contract documents that currently live in the individual email profiles of many different buyers in an organization. Acumatica’s email engine centralizes all of that important communication and makes the process of communicating needs to vendors much more efficient. I haven’t done much with landed costs, but it’s nice to know that this feature is available in Acumatica. Acumatica doesn’t come complete with a full barcoding solution (there are add-ons developed by partners for that), but there is support for some rudimentary barcoding. For example, you can set things up to easily scan items into the receipt screen and have it automatically create a new line with a quantity of 1 for each item that you scan which saves you from having to interact with the screen while you are scanning each item. Again, it’s not a huge feature, but it’s nice to know that they included some basic barcoding features in the base Acumatica product.